How to format a USB Drive on Mac？Want to erase data from the hard drive? This tutorial article will tell you how to format USB drive on your mac without losing data. Not every flash drive out there can be used with a Mac computer right out of the box. Some flash drives have to be formatted first before you can store files on them. In addition, Formatting indeed repairs a corrupted, damaged, inaccessible and even RAW USB or SD card but will erase all saved data. However, losing data is something we don’t want. So is it possible to format USB flash drive on Mac without losing data. Is it possible to format USB flash drive on Mac without losing data? Sometimes, USB drive get corrupted and become raw or inaccessible due to various reason. And you will find the USB drive cannot be recognized, or the system will prompt an unformatted error after plugged the drive, then should we format the USB drive and lose all of data? The answer is no, you are recommended to perform a fast data recovery to recover files from the flash drive before formatting it if you want to keep all your files. Now let’s talk about how to restore the lost data back first. How to restore the lost data from the corrupted USB flash drive? Bitwar Data Recovery for Mac can be used to recover data lost due to deletion, partition errors, formatting, virus attacks, system failures and a variety of other reasons. it is the best data recovery software for mac since it is compatible with any devices such as digital camera, hard drives, SD cards, Memory cards, media players and portable drives. Moreover, this program allows you to preview scanned out data to make a selectively recovery. Free download the USB flash drive recovery software – Bitwar Data Recovery and then install it to the Mac OS X, after installation, connect the USB flash drive to the mac and make sure the USB flash drive can be recognized by Mac OS X. Then simply follow below tutorials to recover data. 1. Launch Bitwar Data Recovery and then find the USB flash drive on the program, click “Next” to continue. 2. Choose quick scan and choose the file types that you want to be recover, and then click Scan to start. 3. The scanning runs to search all existing files from the USB flash drive and in the meantime, the scanned files shows on the window one by one. After the process finished, double click the thumbnails to Preview each file, and then choose the files you want and then hit Recover to save the files. Tips: Please DO NOT save the files backup to the USB flash drive in order to prevent further data loss. After the data recover back, you can format the USB flash drive on Mac. Steps to format the USB flash drive on Mac? 1. Connect the USB flash drive to your Mac computer. 2. Go to Applications > Utilities > Double click and open Disk Utility. 3. Select your USB flash drive on the sidebar, choose Erase. 4. Rename the USB flash drive, choose the format as MS-DOS (FAT) for Format, Master Boot Record for Scheme. Wait for the process to complete, then you’ll get an empty new USB flash drive with FAT32 as the file system. You can reuse it for saving data again. 1. Connect your USB flash drive to your Mac computer. 2. Hit cmd + space to run Spotlight, type: terminal and hit Enter. 3. Type:diskutil list and find out which disk is your USB drive. In the below picture, you can see that /dev/disk2 is the USB drive. 4. Type: sudo diskutil eraseDisk FAT32 MBRFormat /dev/disk2. sudo gives you user right. 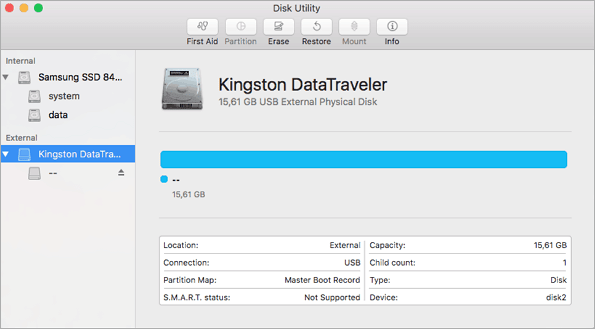 Diskutil calls disk utility program. FAT32 sets the file system. MBRFormat tells disk utility to format with a Master Boot Record. /dev/disk2 is the location of the USB drive. Wait for the process to complete and after this, you can type: diskutil list in command again to check if the formatting has been successful. After this, you should be able to use USB with FAT32 file system to save files again. USB format on Mac can sometimes go wrong or you may accidentally delete some data. Many times, we do not mean to erase something but do it mistakenly. Fortunately, it’s easy to use Bitwar Data Recovery to recover deleted data from formatted or damaged USB drives. Summary：Summary: Here I am going to tell you about various methods which will help you to repair flash drive without losing important data. Why Is Flash Drive Not Working or Unrecognized? Summary：Is your Windows computer not recognizing your USB Flash Drive and prompts “the USB flash drive not showing up”? How to fix it? This article introduced ways to fix USB flash drive not showing up issue in Windows without losing data.